I like this prayer. Can you tell us where we can find the book of this prayer? I am sending the following message to you hoping that with the help of God you can arrange something. In the name the Father and the Son and the Holy Spirit, One God. I am a member of Ethiopian Orthodox Tewhido Church. I believe that I am blessed to be part of this Church. 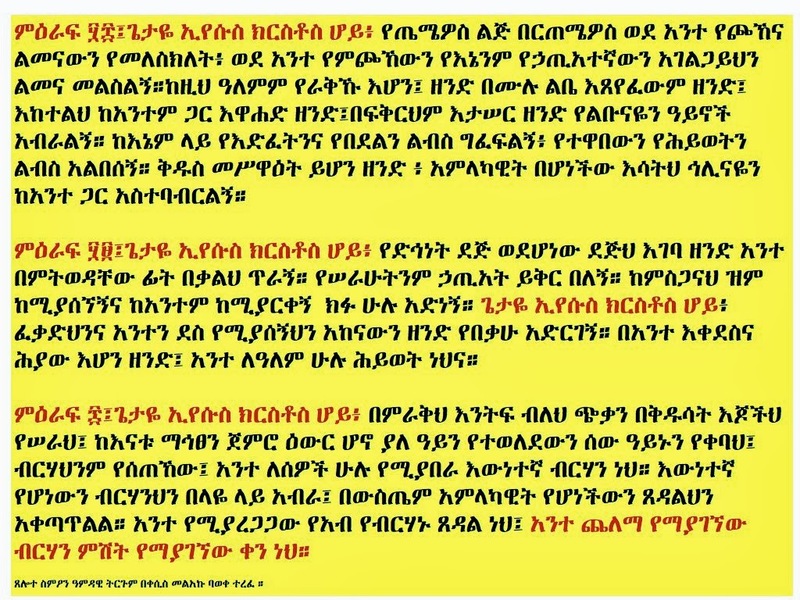 On the other hand, I feel sad when I see all Ethiopian Orthodox Tewhido Church around the world are divided and forgot the word of God which says: “A new command I give you: Love one another. As I have loved you, so you must love one another. By this everyone will know that you are my disciples, if you love one another.” John 13: 34-35. I am listening to different preachers, reading different articles. All are saying that we need to love each other. But the truth is different. We do not have any patience to tolerate each other. We are always condemning others and could not look at ourselves. We think that we can solve the problems by our own wisdom and not praying to God. It seems like we forgot the word of God which says: “Again, truly I tell you that if two of you on earth agree about anything they ask for, it will be done for them by my Father in heaven. For where two or three gather in my name, there am I with them.” Matthew 18: 19-20. I am writing this message to you because I strongly believe in praying together. 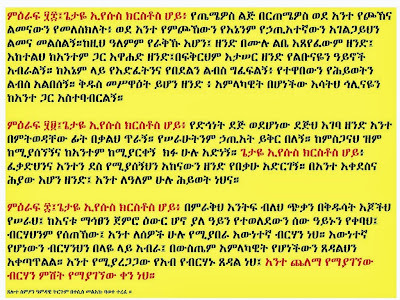 Therefore, please try to make an arrangement for all of Ethiopian Orthodox Church members all over the world to participate on a Special Prayer Day at least two or three times a year. On these Prayer Days, everyone should pray the same kind of standard prayer at the same time wherever they may be. Please, please, please, let us pray together; after all it is written: “Princes shall come out of Egypt; Ethiopia shall haste to stretch out her hands unto God.” Psalm 68: 31. So Help Us God Amen! !